The C-series portable counting scales are available in 30 lb/15 kg, 65 lb/30 kg, and 100 lb/50 kg capacities and feature a rechargeable battery pack standard for mobile weighing, second scale input port (remote scale only), up to 99 stored product look ups (9 direct quick keys), stainless steel platform, piece counts with known and unknown weight samples, backlit blue LCD, preset weight and quantity limits with audible beep alerts, and weight accumulator mode. The C-series portable counting scales are available in 30 lb/15 kg, 65 lb/30 kg, and 100 lb/50 kg capacities and feature a rechargeable battery pack standard for mobile weighing, second scale input port (remote scale only), up to 99 stored product look ups (9 direct quick keys), stainless steel platform, piece counts with known and unknown weight samples, backlit blue LCD, preset weight and quantity limits with audible beep alerts, and weight accumulator mode. 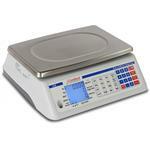 The C series counting scales are ideal for inventory counting where mobility is a must! These durable counting scales offer a full keypad to enter and recall known piece weights and tare weights, metric conversion, 1/300,000 counting resolution, bubble level, and non-skid feet for stability. You can quickly count multiple inventory parts with ease, and 15,000 weight divisions makes them capable of counting the smallest of parts! UL-listed AC adapter included.